BGP No-Export ensures prefixes to not get advertised outside of an AS. 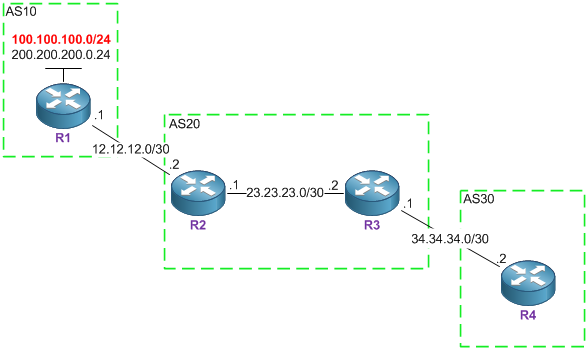 In the diagram below, I’m going to configure R2 to advertise the 100.100.100.0/24 network to R3 using the no-export community so that R3 does not advertise this to R4. Let’s jump on R4 to ensure the prefix has been received. Okay let’s set this up. On R2 I’m going to configure a route-map that sets this prefix with a community of no-export, and apply it outbound towards R3. Let’s check the affect on R3’s 100.100.100.0/24 BGP entry. Hopefully it will have sent the prefix with a no-export community. Easy as that. Let’s verify that this prefix no longer gets sent to R4. There we have it. R4 no longer receives this prefix. It’s really helpful and easy to understand article for no-export community .. This is realy helpful and easy to understand NO-Export community . It very helpful, with simple example to undranstand correctelly. I would like to throw more light on this, You can achieve the same by advertsing the same prefix from R1 AS10 routers to R2 AS20 router. This will tell AS20 routers that as i have recieved a prefix 100.100.100.0/24 with no export from neighour AS10 i will keep this prefix within my AS(AS20) so i wont advertised this to my any external bgp peer ie AS30. this article is good. Explained so well.